The idea for this article just popped into my head because I always wanted to know more about it. Maybe you do, too. Yes, both Iceland and Greenland are islands. Greenland is the largest island and at the top of the world. Both have hardly any people. 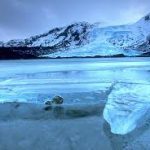 Iceland has a population of around 350,000, while Greenland has a population of around 57,000 even though it’s about 21 times bigger than Iceland. If you glance at the globe, it might make you wonder why Iceland seems oddly green, while Greenland is covered in ice. Eons ago, Viking settlers thought the name “Iceland” would discourage over settlement of their verdant island! Nobody cared if people tried to settle the ice-covered Greenland. But the truth is more complicated, and it has to do with our shifting global climate and Norse custom. 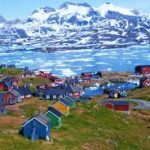 Over 80 percent of Greenland is covered in ice, but its grass was probably greener back in the summer of A.D. 982, when Erik the Red first landed. Sheep and potato farms still flourish in that same southwestern corner of Greenland, which sits at a more southerly latitude than neighboring Iceland. Meanwhile, thanks to the Gulf Stream, Iceland’s sea surface temperatures can be about 10ºF (6ºC) warmer than Greenland. 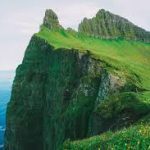 The milder climate means summers are intensely green throughout Iceland, even though 11 percent of that country is still covered with permanent ice cap. When the Vikings first arrived in Greenland, the name would make sense. But by the 14th century, maximum summer temperatures in Greenland had dropped. Lower temperatures meant fewer crops and more sea ice, forcing the local Norse population to abandon their colonies. When the Norse first arrived in Iceland, it was snowing, so they called it Snowland! Later, while journeying to Iceland, a Viking named Flóki Vilgerðarson’s daughter drowned, then all his livestock starved to death as the winter dragged on. Depressed and frustrated, Flóki, the sagas say, climbed a mountain only to see a fjord full of icebergs, which led to the island’s new name. Flóki’s name stuck fast in the Viking world. But one member of his crew spread rumors that the new island was so rich, butter dripped from every blade of grass. Permanent settlement began soon after. 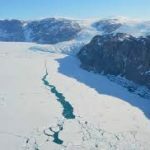 The rapidly melting Greenland ice sheet has resulted in cold temperatures in the North Atlantic, which has actually slowed the Gulf Stream. Should the trend continue, Iceland will likely suffer much colder temperatures and even sea ice, while Greenland will continue to grow warmer and shed icebergs at an alarming rate. In a century or two, it could very well be that the globe will make more sense, and Iceland and Greenland will better resemble the names they were given a thousand years ago. Answers: Greenland is #1 & 4; Iceland is #2 & 3.